Informed citizens have knowledge and understanding of geography and history (see the College, Career & Civic C3 Framework). This is a guest post from Nicole Woulfe, a middle school social studies teacher from New Hampshire and a Citizen U pilot lesson implementer. I created the Geography & the Civil War lesson to allow my students to grow as geographers as we studied the Civil War. So often, students are overwhelmed by the dates of battles, the number of casualties, and the famous names from the war. 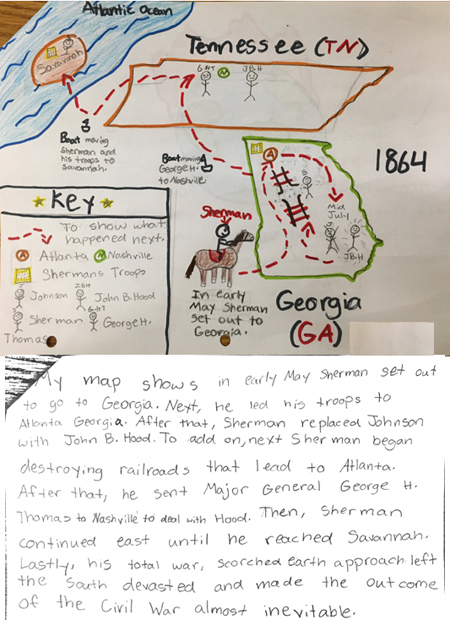 Instead, I wanted them to study two turning points in detail, analyze opinions of the event, and create maps showing the impact of both the Siege of Vicksburg and Sherman’s March. Moreover, I wanted them to fine-tune their geography skills as well as complete a more creative assessment whilst still requiring synthesis of information and evidence. When reading excerpts from Under Siege, I chose sections that show the impact of the siege on the civilians and the landscape. Favorite sections for my students include pages 81-89, the bottom of 107-110, and page 118. At this point of the school year, I’ve modeled reading with purpose with my students in both large group and small group settings so students are able to accomplish this task independently. When modeling this reading strategy, I project a document using my LCD projector after providing a question for students to answer to guide their reading. When modeling for the whole class, we read each sentence aloud and decide at the end of a sentence if the text answers the question. If it does, students choose to highlight the whole sentence or part of the text. If it does not, we move onto the next sentence. Students love to sing Icona Pop’s I Love It when they learn this process. They sing “I love it” as an entire class if the sentence in the text answers the question and should be highlighted and they sing “I don’t care” if the sentence does not need to be highlighted. To create a “cave like” setting in my classroom, students read the text in small groups under their tables. They loved it! I also had groups report out on the evidence they pulled from the text. This strategy is a great way to double check student success and see if they are still mastering the skill of text-marking. To help scaffold the assessment for students, you may preselect maps for students to analyze but I didn’t. I simply gave them the links and let them do their own searching. I gave students three class periods (50 minutes each) to synthesize the information, plan, and complete their map assessments. In my classroom, we utilized a document camera and an LCD projector for students to show their work to their peers to get feedback on the formative portion of the assessment. Encouraging a culture of collaboration and growth mindset for students is key to making this formative sharing activity successful. Discussions in my class focused on ways to explain your thinking using cited evidence as well as strategies for using the whole page and adding details to help the map viewer understand. When polled, 57% of my students found this feedback sharing session helpful and the overall quality of work on the assessment improved immensely when students completed the task as a summative.